The - MFX130, in Custom gauging, is built on round core wire wrapped with a silk-nylon and then finished with phosphor bronze wrap. This design results in a sweet and melodic string with remarkable playability at any fret position. The high-quality carbon steel round core wire has high tensile strength to give the FX increased durability, allowing you to stay in tune and play longer. The round core wire and custom gauging also reduces finger fatigue and permits quicker transitions from string to string. Users of the FX sets will note the increased sustain, brilliant attack and cleaner harmonic overtones. Fast order turnaround. The lighter strings are great. I have a Tacoma Papoose guitar which is a short scale (19") which sounds great with these new strings. They are very soft to the touch and a bit quacky which is a good thing on the papoose. I use it to play Brazilian choro music. Strings by Mail got them to me in just a couple days. Always excellent service. THE STRINGS ARE BY MARTIN. NEED I SAY MORE? I've been using Martin MFX130 Flexible Core Silk & Phosphor Acoustic Guitar strings on my Seagull Artist Studio guitar ever since I found the strings. I tune down 1/2 tone to minimize neck tension and keep the strings very close to the fretboard, even though these are already low-tension strings. These strings make the instrument sound bright and crisp. I would say these strings create harpsichord-like sounds while other strings I've tried create piano-like sounds. These strings are very easy to play. My only complaint about them (minus one star) is that they don't last more than three weeks or so of playing an hour a day. After that amount of use, they lose some brightness. Don't get me wrong, though - they're great strings, and for the price, I don't mind replacing them often. 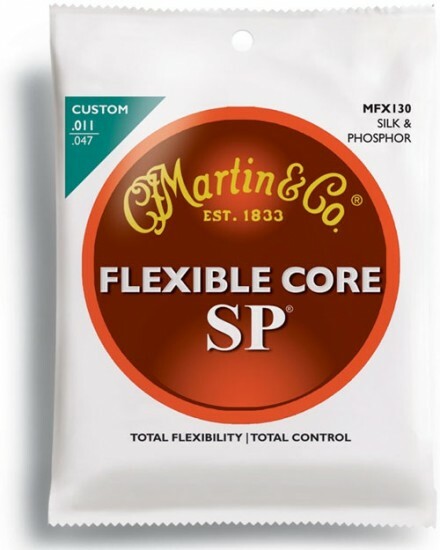 Martin FX Silk and Phosphor Strings are true to the manufacturer’s description: (i) a sweet and melodic (ii) with remarkable playability at any fret position (iii) increased durability (iv) stay in tune and play longer (v) reduces finger fatigue and (vi) permits quicker transitions from string to string.